Throughout both the road trip along the Midnight Sun Road and the Santa’s Road we spotted shaman drums several places. On every museum including Saami culture there has been at least one. Angelo has a tender eye for these drums. At the Sámi Museum Siida, the time to set the record straight had come. 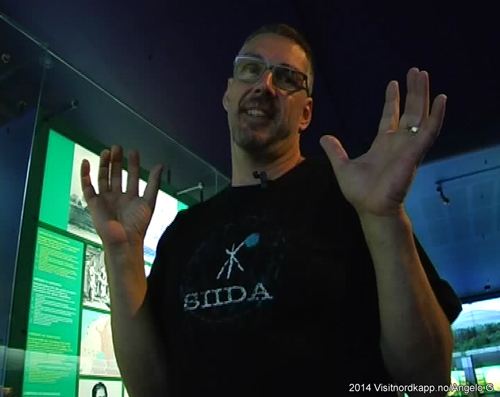 We asked Mr. Markku Stylman at the museum to tell us more about their drum in Inari. This drum is the only shaman drum left in Finland. When Christianity was enforced upon the people of the Arctic, the religious leaders of Saami tribes became enemies of the King. The shaman tools were also unwanted. In Finland, the enforcement was also cruel. 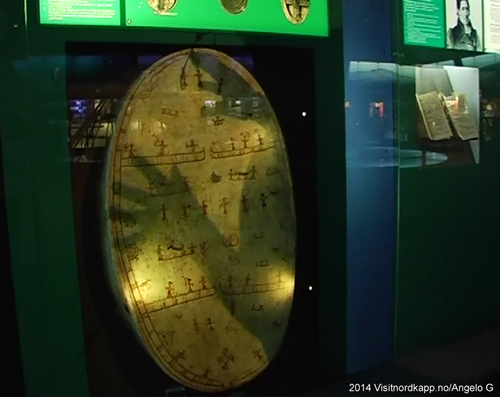 The drum behind the glass was saved because someone smuggled it to Sweden. We have, in fact, borrowed it from the Nordic Museum in Stockholm, says Markku. The Saami religion was a religion of nature. The Saami people believed that everything living in the nature had its own spirit. 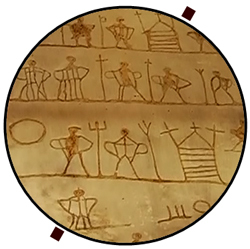 The Saami people believed in a three dimensional world. The Gods were in the upper, people in the middle and under the people was the lower world. A special man of the tribe was the shaman, or the noaidi. He was a medium. He was a wise man, a healer, and could move between the worlds. The drum was used to travel between the upper and lower world. To do this the shaman would use a hammer made of reindeer bone and beat on the shaman drum. He would also joik, to sing the traditional Saami way. The idea was to get into some type of trance and be able tap into the other dimensions of the world. The shaman, drum and joik were banned. The Saami people are now Lutheran, and the Skolt Saami are orthodox. Incidentally, even to this day joik is banned in the church in Kautokeino, Norway. And it is not banned by the authorities. Sadly, the de-saamification has been so stern that parts of the Saami culture is being repelled by the Saami people themselves (the Stockholm syndrome of the church). Kautokeino is very much a Saami village and a hub for reindeer husbandry. Joik is not, normally, banned other places. Another important part of the old Saami religion was their sacred places, the seidas. One of these sites you find 11 km from the museum, in the Inari Lake on the island of Ukonkivi, the Ukko Island.